(TibetanReview.net, Mar27’16) – While China has made it clear that its railway network will be extended up to the Tibetan town of Kyirong, close to Nepal’s border, possibly by 2020, a Nepal-Tibet connection may be realized only in the distant future. A Chinese expert has now said extending China’s railway network in Tibet into Nepal while possible will be highly challenging and costly but technologically feasible. “Building the rail line may encounter many difficulties as it will pass the seismic zone and the Himalayan Mountains”, China’s state-run Globaltimes.cn Mar 23 quoted Wang Dehua, director of the Institute for Southern and Central Asian Studies at the Shanghai Municipal Centre for International Studies, as saying. He has added that the cost will be at least USD four billion and the project could be completed within five years. “Given the current technologies, it will not be a big problem,” Wang has added. During his just concluded visit to China, the Nepalese Prime Minister Mr KP Sharma Oli asked his Chinese counterpart Mr Li Keqiang on Mar 21 to extend the railway network from Kiyrong to the Buddhist pilgrimage site of Lumbini, noted India’s PTI news agency Mar 24. 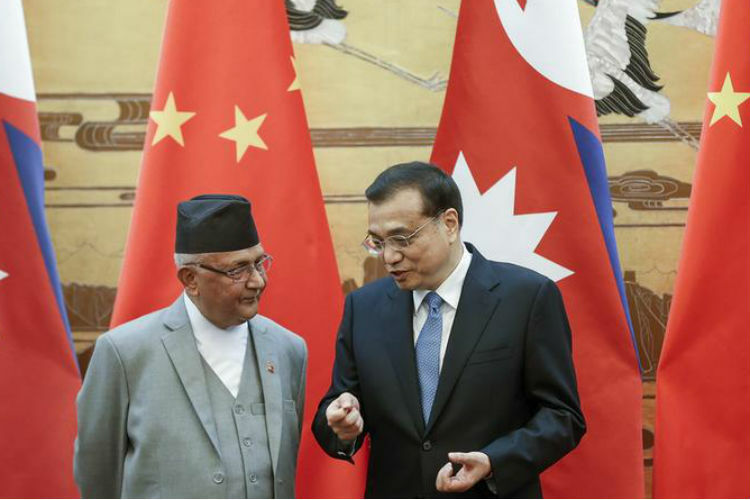 Globaltimes.cn cited Zhao Gancheng, director of South Asia Studies at the Shanghai Institutes for International Studies, as saying the proposed railway may lessen Nepal’s dependence on India but did not mean that China was trying to compete with India for influence on Nepal. After the Li-Oli meeting, Hou Yanqi, deputy head of the Chinese foreign ministry’s Asia Division, told the media that Beijing would encourage Chinese firms to look at the internal rail plan to extend the rail network to Nepal.